“Congress, as a co-equal branch of government, has a duty to conduct oversight of departments and officials,” Mr Neal said. That’s an interesting argument. If it’s coequality that creates the oversight duty, then the coequal Executive Branch has an identical duty to conduct oversight of House (and Senate) Committees and members. increasing the flexibility associated with retirement accounts. If approved, individuals would be allowed to stash money into IRA accounts beyond the current age limit of 70½. It would also delay when individuals are required to begin taking required minimum distributions to 72, from 70½. These are moves in the right direction, but they seem to proceed from a false premise, and some unanswered—unaddressed, even—questions. One question is why there should be any age limit (or any other limit) on saving money into IRA (or other retirement) accounts. Another question also is age-related: why there should be any age after which distributions from retirement accounts must be taken. such intervention is vital to protect both the welfare of users and the fundamental values of an open internet. People shouldn’t have to rely on individual companies addressing these issues by themselves…. But it’ll be badly misplaced. President Donald Trump is moving to stop further direct aid to the Caravan Triangle of El Salvador, Guatemala, and Honduras over those nations’ failure to control those caravans by putting to actual use that aid—which was intended to support improved economies, the living conditions within those economies, and training to deal with gangs and the drug trade. [T]he State Department…notified Congress that it would look to suspend 2017 and 2018 payments to the trio of nations, which have been home to some of the migrant caravans that have marched through Mexico to the US. border. 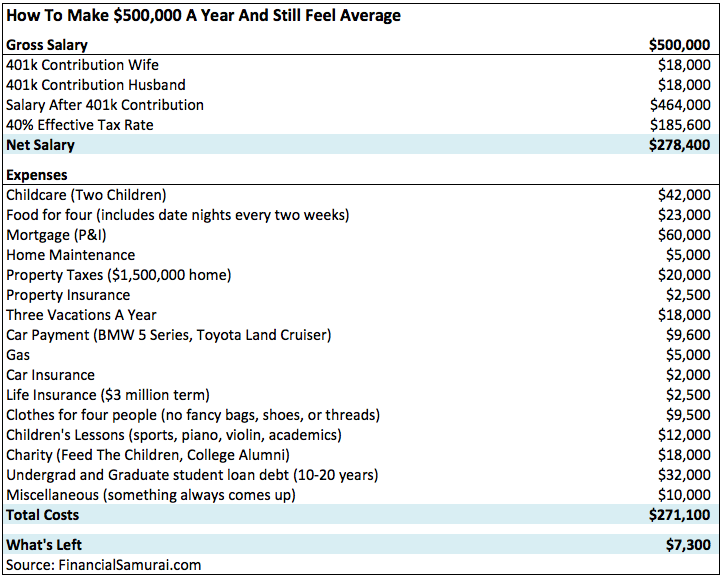 Some folks think an annual income of a half million dollars leaves them…average…and strapped. The tweeted image of an example of this delusion is below. CNBC represents this as a real couple. You can read the CNBC article linked to in the tweet here, but the image and many of the comments in the tweet’s thread are instructive by themselves. So $36K in 401k contributions should be added to “what’s left over,” along with $18K in charity contributions (not an expense either). Senator and Progressive-Democratic Party Presidential candidate Kamala Harris (D, CA) wants the Federal government to pay a significant fraction of public school teachers’ salaries. The Federal government paying a significant fraction of public school teachers’ salaries means Federal government control of our public schools. Those schools are in enough trouble; we don’t need the Feds getting in the way, also. Aside from that, this is just another Progressive-Democratic Party attempt to grab our money, this time to deny it to our heirs. Again.